Mass incarceration, solitary confinement, maximum penalties, domestic violence, and sexual assault—these topics are regularly analyzed, discussed and contemplated at John Jay. But to really feel the impact of the criminal justice system in America, Associate Professor Amy S. Green in the Department of Interdisciplinary Studies worked for three years developing and then directing the play whatdoesfreemean?, by Catherine Filloux, which was produced by Nora's Playhouse and recently finished showing at The Tank theatre in Manhattan. To learn more about the play, her process and her hopes for change, we sat down and chatted with professor Green. To learn more about what it’s like being in solitary confinement—also known as the “Segregated Housing Unit” or the “SHU”—Green and her team spoke with a group of formerly incarcerated women. 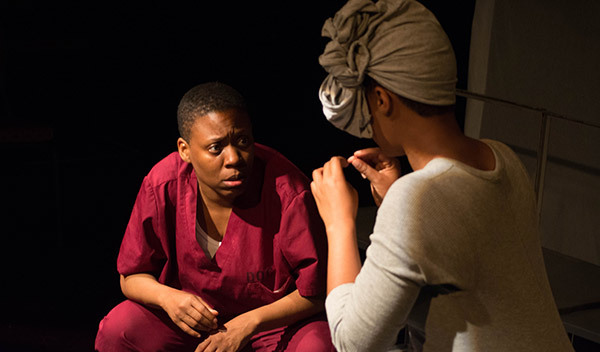 “When we asked one of the women what it was like to be in solitary confinement, she said, ‘Lock yourself in your bathroom for an hour and see what that feels like.’ That image really worked for us and it became a line in the play,” says Green. The character Mary ends up in the SHU because she was trying to get Ann critical medical attention. While in the SHU, Mary starts feeling the affects of complete isolation. “It’s a sensory deprivation that takes about 15 hours for people to start to decompensate, and then the brain takes over,” says Green. In the middle of the stage, in a simple box of light, Mary counts each of her body parts to stay connected to the real world, knowing that if she escaped reality, it would be hard to come back. Sadly, Ann dies while Mary is in solitary confinement. One of the takeaways for Mary, and also the audience, is that she has to push past her own values, beliefs and personality to save herself from the system. “Mary’s public defender sees potential in her and counsels Mary to do whatever she needs to get out,” says Green. “And if that means telling the review board how grateful she is for everything she’s received, and how proud she is of making sandwiches in the kitchen, she’s got to do it because she deserves another shot at life.” There’s a mental toll it takes on Mary to debase herself to the board—with a myriad of “yes, sir” and “yes, ma’am” answers—but after Ann’s death, survival and reclaiming her life takes on a whole new meaning.